Although bread machines can be almost impossible to distinguish from one another in terms of features, and therefore hard to choose, the Panasonic SD-YD250 has some features that make it unique. But first, we’ll talk about the things that are commonly found on bread machines. The Panasonic SD-YD250 will make loaves of bread in three different sizes. They call it small, medium, and large but upon closer inspection they are about 1.5-, 2-, or 2.5-pound loaves. The machine is intended for larger families. If using the rapid cycles, the Panasonic SD-YD250 will bake bread in about 2 hours. It also features a 13-hour. You can use the timer to set when you want the machine to start baking, such as closer to when you will eat it, hence the name “delay” timer. 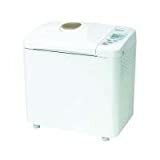 The Panasonic SD-YD250 is a simple bread machine. That’s because it doesn’t have all the complex settings as some of the other machines. This is good for people who don’t want to bother with too many settings. Still, it has everything you need to bake basic bread. It has 3 crust settings: light, medium, and dark. And in terms of bread and dough options, it has basic, whole wheat, multi-grain, French, pizza, and cake. There’s a beeper that will tell you when to add fruits and nuts too so that they don’t get crushed during the kneading cycle. Now for some of its unique features. The Panasonic SD-YD250 has an automatic yeast dispenser on the lid. You just add the right amount of yeast to the dispenser and at the right moment, it will release into the dough. Yeast is quite an important ingredient and turns bread from good to great when added at the right moment. So Panasonic was thoughtful in adding this to their bread maker. Next, unlike many other machines that have a viewing window, the Panasonic SD-YD250 does not have one. Panasonic says that without a viewing window, there are three advantages: excellent crust, good rising, and even colour. In our tests, we tried to see if these advantages were true. After unwrapping the Panasonic SD-YD250 and holding it in our hands, it left us with a good first impression of Japanese quality. We tested the machine by first baking simple bread. We added everything into the bread machine as well as the yeast inside the yeast dispenser. When the machine starts, just like the Zojirushi machines, it will wait a little for the ingredients to reach the correct temperature. This is a little detail that Japanese machines seem to have and really reflect on their desire to achieve perfection. Just keep in mind that if you want to bake bread, just through all your ingredients into the machine instead of leaving everything out yourself. For example, you probably keep yeast in your refrigerator and wait for it to come to room temperature before adding. But if the Panasonic SD-YD250 you can simply add it into the dispenser. Very handy. The machine is a little tall and will not make traditional loaves. However, it is as quiet as a mouse. When the bread came out, it looked almost professionally made. The crust colour was remarkably even on all sides and the shape was beautiful. We learned to follow instructions carefully when it comes to baking with bread machines (especially Japanese ones) so if you do the same, you should have no problem achieving the results we did even on the first try. We felt that the Panasonic SD-YD250 is easy to use and has the precision needed to bake perfect bread. We also like to point out that although Japanese-made machines tend to be more expensive, the Panasonic SD-YD250 is actually reasonably priced. It’s just over $100 and for that price, we would definitely choose this over Oster or Hamilton Beach or other bread machines under $100. We haven’t found any under $100 that produces the same quality as this Panasonic. But we do want to warn that the machine is quite large and makes large bread in general, so it might not be ideal for singles and small families. The Panasonic SD-YD250 makes amazing bread. Its automatic yeast dispenser is a thoughtful addition by Panasonic, and turns bread from good to great. The attention to detail used by Panasonic to build this machine is impressive. Overall we’re impressed by the Panasonic SD-YD250. The fact that Panasonic was thoughtful enough to include an automatic yeast dispenser is brilliant. Just take out our ingredients and add it to the machine, and it will do all the waiting, kneading, rising, and baking for you. Another thing we liked was the consistency of the bread. The colour of the crust was always even all around. Given the size and the ease of use, we recommend this machine to families with children in particular. Absolutely loved this breadmaker, got mine unused from a retailer store for about $25. Works incredible! I didn’t notice a setting for dough. Does anyone know if there is one? Yes, there is a dough cycle. Makes awesome pizza dough. The pizza cycle on bread machines is a dough cycle. I’ve had this machine for a little over five years. I make whole wheat sandwich bread weekly and a variety of doughs (for buns, pizzas, baguettes, dinner rolls, etc.) in between. After our most recent cross-country move (its third move), it will not bake a loaf of bread correctly. I can still use it for dough, but my baked loaves come out like bricks. I’m trying to decide whether to purchase another (if I can find one) or try out a Zojirushi.